Cookistry: Whoopie Tortoises! Candy in a whoopie pie pan! Back when I was a kid, I loved the candy sold as Turtles. What's not to love - chocolate, caramel, and nuts. So darned good. Other companies made them, too. Since the name Turtles is apparently trademarked, another company started selling them as Pixies. So, if I made them in a whoopie pie pan, it makes sense to call them Whoopies, right? Or maybe tortoises? Or, I know! Whoopie Tortoises! They sound fun, right? This whole train of thought started when I got a whoopie pie pan from Good Cook. Why, yes, they do send me lots of stuff. I might be starting a Good Cook annex in my garage to store it all. One thing I've learned since I started working with them is that new Good Cook products are not the same as Good Cook products from many years ago. As I've been replacing my old tools with new ones, I've got to say that the quality is much better these days. Or maybe I just beat the heck out of the old spoons and spatulas. The whoopie pie pan I got was really well-made and sturdy with a nice nonstick finish. So of course I decided to NOT make whoopie pies. 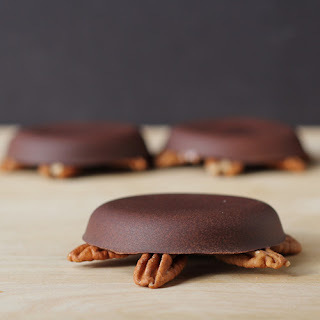 The idea actually came from my husband, and the more I thought about it, the more I thought that it would be kind of cool to build the Whoopie-Tortoises upside-down so the "shell" would be really smooth and perfectly round. Put the the chocolates into a microwave-safe container - I used a glass measuring cup for easy pouring. Melt in 30-second increments, stirring each time, until the chocolate is melted. When the chocolate is melted, divide it among the 12 whoopie pie cavities. You don't need to make them exact - this is candy, not science. Use a spoon to smooth it out and push it up the sides of the cavities a bit. Put the pan in the refrigerator to set the chocolate. Meanwhile, put the caramel in a saucepan (nonstick is a good idea). Melt on low temperature until it's at a pourable/spreadable consistency. When the chocolate has set, divide the caramel among the 12 whoopie cavities, on top of the chocolate. Smooth it out if it doesn't flow to fill the hole in the chocolate, but be careful because the heat of the caramel will begin melting the chocolate. Arrange the nuts on top of the caramel. If you like, let the nuts peek out beyond the edges of the candy to form head, feet, and tortoise-tail. I used broken half-nuts for the tails, and then I decided that the heads would look better if the flat side was facing up. It doesn't matter. No one's going to autopsy the candy, they're just going to eat it. It doesn't matter if the have eight feet, if that amuses you. And then I added some extra nuts in the middle, just because I like nuts. Put the pan in the freezer to chill for 10 minutes or so. Once set, the candies should slide right out of the pan. If yours are sticking, let the pan sit a little longer in the freezer and try again. You shouldn't have to pry them at all - they'll pop right out. *You can use your own homemade caramel, or buy it already made. You want the stuff that's a little soft, like the caramel that you'd use for coating caramel apples. Kraft caramels would be fine, or King Arthur Flour sells it in a brick. I received the whoopie pie pan from Good Cook as part of their Kitchen Experts program.